Ducati will make numerous changes to its factory GP11 MotoGP machine ahead of the resumption of winter testing in February after Valentino Rossi ended his Bologna factory debut in a lowly 15th place. Rossi’s failure to break into the top ten was the major talking point at the end of the two-day test. His struggle to finish only higher than rookie Karel Abraham and Toni Elias captured way more attention than Casey Stoner’s breathtaking Honda debut as the 31-year-old clocked a best time of 1.33.761. Bad result, positive test was the vibe around Ducati management who had collected a wealth of data and information from Rossi as he got his first chance to evaluate the GP11 machine this week. Rossi exclusively tested Ducati’s 2011 Big Bang engine on the second day, but it wasn’t engine performance that was hindering the nine-times world champion. Ducati technical guru Filippo Preziosi told MCN Rossi had been impressed with the level of rear grip, engine performance and traction control. But the main weakness remains a front-end issue and changes to front-end geometry, weight distribution and rider position will be implemented ahead of Rossi’s next appearance in Sepang in early February. Preziosi said: “After these two days of tests we will go back to Ducati for a meeting, where we will decide which path to take between the two engines, the big bang and the screamer, although the information we have is pointing towards the former. "It will be a decision we will make by analysing the data in depth as well as planning the way forward around all the other things we learnt at the test. The objective is clearly to allow Valentino to ride like Valentino. 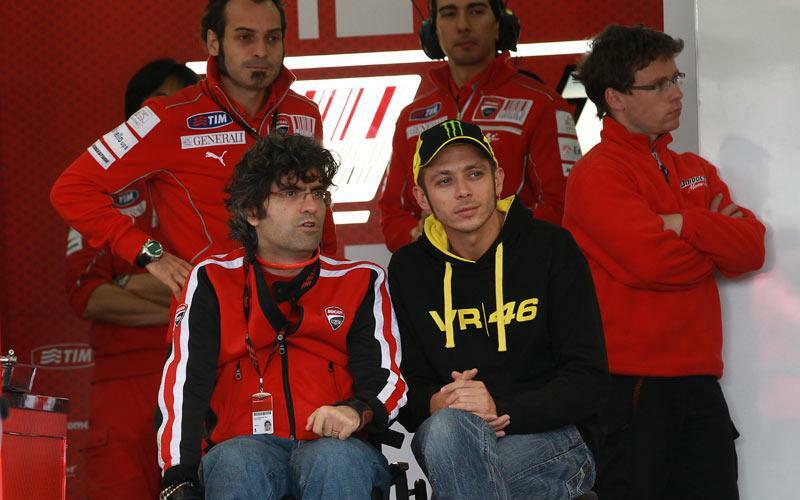 "We need to change the bike to suit Valentino. We know we have to improve the bike in order to achieve this, especially the front end. He has given us some very precise information and now it is down to us to use it. For in-depth analysis of Rossi’s first Ducati rider, see next Wednesday’s (November 17) issue of MCN.